So, you think you know it all? different elements but one in spirit! Coexist, embrace harmony, together man knows no limits! They teach man value of service, despite death! Find joy in being selfless & make love not war! However big, you need to step back at times, for a greater boon! So, you still think you know it all? Learning is immense, hidden in each second, each moment! Open up your self & in nature let your being immerse! What would I do without the Write Tribe prompt's I wonder!! 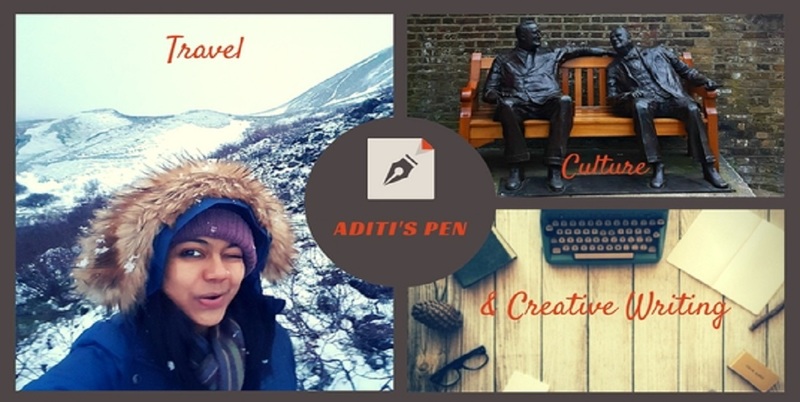 So, you think you know it all - this cue has been provided by Jairam Mohan, one of my favorite bloggers whose fiction and mythological related posts are brilliant, effortless and definitely keep you coming back for more! So, I am pursuing an online course at Coursera. We are into the 4th week now and this course has let me explore and open up to the world in an entirely new way. It's like I have a new pair of eyes! Creating Site-Specific Dance and Performance Works means what it actually suggests....Creating a piece of choreography NOT inside the four walls of a class or on a stage but to go out, explore the world, let the architecture, history, community, social relevance of a 'site' inspire you to create a site-specific work. I have always believed that Dance is Universal language and I have wanted for long to use it as a tool to spread awareness about important social factors inflicting our society and in my own way create a better world by spreading joy and happiness through 'movement'. I didn't know how and where to start. I've had plenty of ideas and my diary has seen several 'plans' and outlines of opening a Dance NGO etc etc but the implementation never happened. What stopped me? Too much thinking, to much detailing and then a point somewhere which made me go " I'm not ready yet". Lack of confidence, inexperience, not enough expertise pulled me backwards. And then I stumbled upon this course and I said "Why not!!" The past 4 weeks had made me go out of my comfort zone, out my home, with a camera and note-pad in hand to lands where I would not have thought I'd go and do a twirl, a twist or a split!! The Course structure is such that every week we have a series of online video lectures post which we are asked to do an assignment. This assignment is anonymously evaluated by three peers who are also taking this course. I'm privileged to be in a class where I share the space with Choreographers, Dancers, Actors, Theatre personalities, Art students, Dance educators, Media & digital arts executives etc from well all over the world - Greece, Taiwan, Istanbul, Brazil, Italy, Russia, Spain, India, New York, Boston, Mexico...whoosh...you name it and it's there on the Google maps! So so much talent and so much diversity! I thought of sharing my assignment 2 here for (a) a general record, (b) to invite feedback from friends and peers (since the assignment evaluation was anonymous we are not able to follow through the entire project of the peers), and (c) as a reminder to keep going...to not only complete the course successfully but to actually this time execute it to finality! So here goes mu assignment (as it is! )....and fyi the score/evaluation has already been completed for this assignment. And a very very special mention to my Mommy, my husband and my friends from my dance school - Shivani, Sheena and Manas...Thank you and love you all!! My idea of creating a Site-specific work is to primarily bring about a change for the betterment of our society. This piece will focus on the importance of Education as a tool to educate and empower one and all. Illiteracy is a major problem that plagues the Indian society. Despite the government spending huge amounts on education, 100% literacy still remains elusive and a distant dream. In India today, 4% of our children never start school. 58% don’t complete primary schools. And 90% don’t complete school. The site selected for this particular piece is primarily a school, which is a temple of knowledge. Physical Site - I intend to choreograph a promenade performance here which will use various corners of the school – stairs, classroom and the open field/playground each signifying and furthering the cause of education. Inside the classroom, I would like to play with various inventories available - 2 entrances, set of windows on top, one huge window, benches, chairs, blackboard, whiteboard, table, bags, duster etc. If you see the photographs below the classroom setting has not been changed here. But for my performance I would be using only 7 benches and chairs along with one teachers table.. There are two entrances to the class and on the other end is a very well lit window. I want to use the window as a representation that education ‘lights up lives’, that education transforms lives and leads one to enlightenment. Current Use and Community – The particular school chosen is Fr. Agnel School, Noida whose vision is to “provide Excellent Education as per the principles of equality, love and brotherhood matching it with the best practices of education and student development” They also run a charitable institution called ‘The Father Agnel Ashram’ which provide shelter, education and skill training to the poor, orphaned and destitute children. I want to work with this community particularly and choreograph the finale of the performance with them in the open field. Once the original work is choreographed in this school, I want to place this piece in different sites of "education learning'. This could range from private institutions, government schools, NGOs working for education for girls, orphans, street children and in rural India, community schools etc. I am very much inspired by the work of Martha Bower/Dance Theatre and Etcetera and Anna Halprin both of whom focus on community largely and envision to create a better world through Arts/Dance. Though I have no prior experience in creating such works, I aim to start a similar Dance based revolution in India which will promote important social causes through Dance. Since I aim to do a promenade performance, the audience structure varies as the choreography moves to different locations in the School. 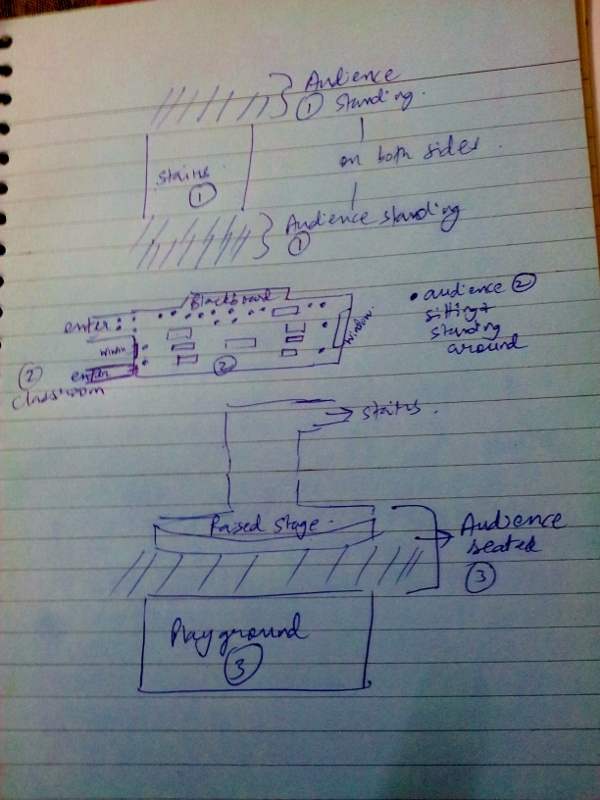 The below sketch gives a fair idea of the audience structure and where they will be placed as the choreography enfolds. I have divided the piece into 3 parts and the audience would be required to walk from one place to another. Part 1 - The site focused is the stairs which lead to the classroom. The audience is standing on either side of the stairs. Part 2 - The classroom setting will have 7 benches and chairs along with the teachers table as shown in the sketch. The audience will either be seated or standing around the space to view the performance. There are two entrances which can also be a gateway for the audience to view the performance from outside. Part 3 - The audience will be seated on a raised stage in an open space where they can view the dancers in front in the open green play field. The number of audience would vary from 20-30. Though the last stage happening in the open field can incorporate a larger number of audience, the number has been restricted due to the limitation of space available in the classroom. The piece will not be ticketed as it's main aim is to promote a cause. Although, we could look at the options of fund raising/ donation at a later stage. The performance could run at regular intervals of time making it open for a wider audience. So once the final piece (part 3) is being performed (by the community students), the part 1 of the choreography would be started for the next audience members group. I sought the help of my friends to give a better illustration of the visuals of the site. 1. The below picture depicts the stairs leading to the classroom, the window, railings and stairs provide good inventory for a choreography. The audience would be placed on either side of the stairs. 2. The below pictures are of the classroom where part 2 of the choreography will unfold. Benches, blackboard, books, tables, windows etc will be used to enhance the site-specificity. The class setting will be changed to only have 7 benches as in the sketch below and the audience will be seated or standing around the area. 3. The below photos show the play-field where the performance will take place in an open field and the finale will be danced by the community students. The audience will be seated on the concrete raised platform in the background of the school building. Site - Specific Dance - Work inspired by the elements of site itself where the artistic decisions are made in dialogue with the site. Promenade Performance - A site - specific performance where the audience walks to specific locations within the site as the performance unfolds. Site Inventory - Otherwise known as "casing the joint", this is a process of taking stock of what is found in a site: counting elements (windows, lights, poles), measuring distances between points, or the act of noticing simply what is there without any preconceived ideas or agendas. So friends what do you think? I really hope I'm able to take forth my ideas and put them into actual practice and execution! Fingers crossed!